Two Posts today! Scroll down, please! Hello Everyone! Sorry I have been quiet lately. Between my work, school and not feeling the best I have been keeping quiet! Today I am sharing a project using some brand new stamps from DRS Designs!! I used the technique from the Technique Junkie Newsletter called Acetate Sparkle from the August/ September 2005 newsletter. Thanks so much for stopping by! Hope you have a wonderful day!!! Hey Everyone- It is time for the September's New Release Blog Hop! The Dudettes love this time of month when we welcome new citizens to the Dude Time Doodles family. We've got fun images for haunting -- Colonel Creepy, Wanda Witch, Fanny She Devil and Grim Grisham. If your Dude is a hunter, then Heath Hunter is your guy or hunka-hunka Babe Watcher who is searching for two legged *dears*. And finally, Knockout Nancy proudly sporting a black eye! Our hops are always one big circle. So, no matter where you get on, you will always get around to see each new image being released today. 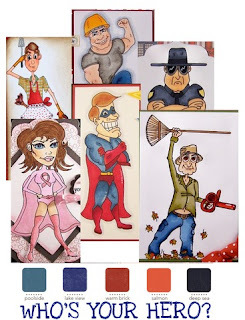 A lucky winner will receive one Dude Time Doodles image FREE!! All you have to do is leave love everywhere you hop, since one of the Dudettes is the MYSTERY HOSTESS!! 10 AM EST on September 28th. Dude Time Doodles has various HALLOWEEN images on sale until the end of the month. Hello Everyone! This is a SNEAK PEEK to the Technique Junkie newsletter Cd 9! This is a peek at the technique called POLISHED METAL. from 10-10 through 8-11. But that's not all! There are also 10 Bonus Techniques on the CD! That's 100 techniques in all!! Want to see what the tutorials look like? *This is in .pdf format. It will open automatically if you have Adobe Reader installed on your computer. NOTE: This is a large file. Click HERE to see a list of what is on all of the Technique Junkie CDs. Now you can own the entire 9th Year of Newsletters Right on your Desktop! Thanks for stopping by! I hope you have a blessed day! 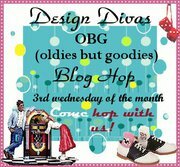 DESIGN DIVAS Oldies But Goodies Blog Hop! Hello Everyone!!! Welcome to the September Design D.I.V.A.S. Oldies but Goodies Blog Hop! Our challenge for this hop is to use items in our project that are at least six months old. I know we all have some of those in our crafting supplies!! 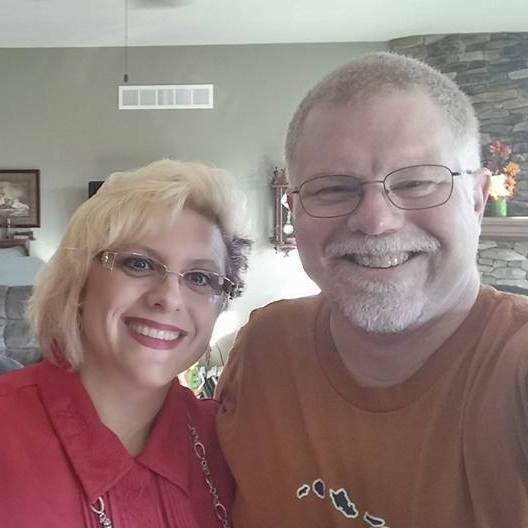 If you have arrived here from Deb's Blog, you are in the right spot. To start at the beginning of the hop, be sure to go to Carol's blog. 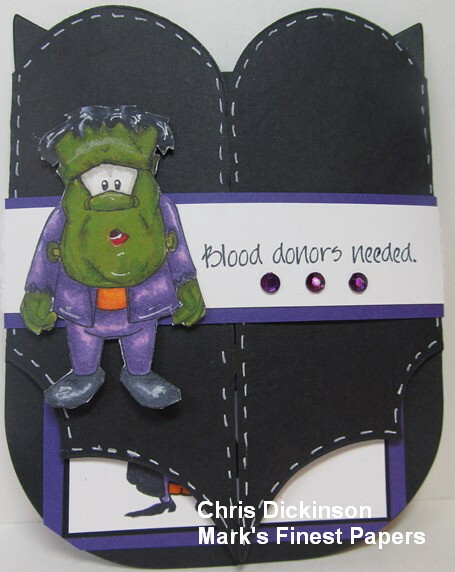 Do you have ever have cards you think you had a touch of Creative genius for and can't wait to create it? Well, this was one of those cards for me... I have had this idea in my head for THREE weeks ever since I saw the Sneak Peek to these fabulous fall images! Unfortunately, I have been laid up with my surgery and the only stamping I have done was my HAVE TO's. Although... I didn't REALLY HAVE TO - but more of I wanted to keep up with my Design Team duties. On this project, I had a different ribbon in my head. I think I used is on something else, so settled for simple white grosgrain. Here are some details to my card... I started out by stamping Frisky Florence on white storm card stock and colored her in very quickly and simply. I did not focus on the detail of coloring her because I figured she would be covered up! I then carefully cut around her and cut the hat completely off. I even trimmed the sides of her skirt down because it stuck out too far for the mummy look right. I used a Craft Knife to cut in between her body where her arm bends on both sides, so I could weave the ribbon through it. Once Frisky Florence was cut out, I put adhesive on the front of her legs and behind them and started to "mummify" her. :) I worked up each leg and then her body. Some of the ribbon I cut and glued to the back to get her to look well wrapped! I used the Marbled Smooch technique on the COOL CARIBBEAN cardstock (my oldie but goodie!) panel and layered the card with Black and White cardstock. I embossed the blue panel with the Sizzix Flowers and Flourish set. I used the Spellbinders dies called Ovals and the Elegant Ovals along with my Grand Calibur! I hope you have enjoyed your visit here. It is such fun "hopping" with these talented ladies! I am the last stop on this blog hop. Thanks so much for stopping by! We hope you will join us again for our next hop the third Wednesday in October! Thanks so much for stopping by! I hope you have a great day! Hello Friends! Welcome to the DUDE TIME DOODLES!! Today is the beginning of the INSPIRATION CHALLENGE! This months challenge is to use the Inspiration AND the theme MY HERO!!! 1. 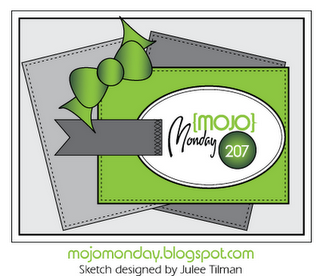 Use the image to get your mojo moving. 2. You are not required to use BDD images although it would make us really really happy and giggle a lot if you did! 3. MUST be a masculine themed card, you can use humor, innuendo, be a little naughty, sarcastic, but it has got to be for a DUDE! 4. Be sure to use the InLinkz on the Dude Time Doodles Blog! 5. You have one week to link up your projects. My card today uses Harold Hammock. They ALWAYS make me smile. I love these fun images!!! Thank you SO MUCH for stopping by today! I hope you have a VERY blessed day! Hello Friends, After the past three weeks, I am praising GOD!!! I think I have been battling some kind of virus and have turned the corner yesterday. My energy is back and I am feeling "almost: normal!" Praise GOD!!! Thank you for stopping by! Have a great day!!! Hi Everyone! Welcome to my blog! I was in need of a few thank you cards, so I created this one! I love the Peachy Keen stamps! 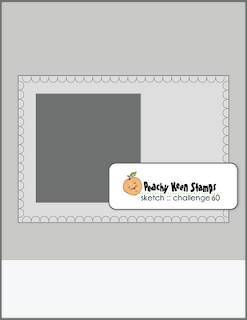 They are so cute, so I thought I would play along in the Peachy Keen Sketch Challenge! Thanks for stopping by! Have a great day!!! Hello! Welcome to the September 2011 MFP New Releases Blog Hop! This week's new releases are:Autumn Glory, Boo To You, Covered Bridges, Get Your Broom On .For your convenience, all these sets are available TODAY at Mark's Finest Papers. For your chance to win: Comment on the following Design Team members' blogs TODAY before midnight EDT. There will be ONE random winner chosen from the comments on today's Blog Hop blogs. That winner will win Get Your Broom On. We will announce the winner's name on tomorrow's MFP blog post. Thank you for stopping by! Hope you have a great day!!! Today, I have two cards to share with you! I created both of them for different SCS Challenges. Mark's Finest Papers sells a WIDE variety of Charms, Hat Pins and other Embellishments! Be sure to take some time to check all of it out if you have not done so already! For your chance to win: Comment on the following Design Team members' blogs TODAY before midnight EDT. There will be ONE random winner chosen from the comments on today's Blog Hop blogs. That winner will win Covered Bridges. We will announce the winner's name on tomorrow's MFP blog post. Now - to hop through the BLOG, if you are just arriving here...you may want to start with Emily's Blog - she always inspires me with her Clean and Simple style! Otherwise, where ever you are in the HOP - ENJOY! Karen - GO HERE NEXT - Karen is going to WOW you! Thanks for stopping by! Happy Hopping and have a great day! I have two posts today! Please take a moment to scroll down and take a look!!! Thanks! This week's new releases are:Autumn Glory. Boo To You, Covered Bridges, and Get Your Broom On.For your convenience, all these sets are available TODAY at Mark's Finest Papers. 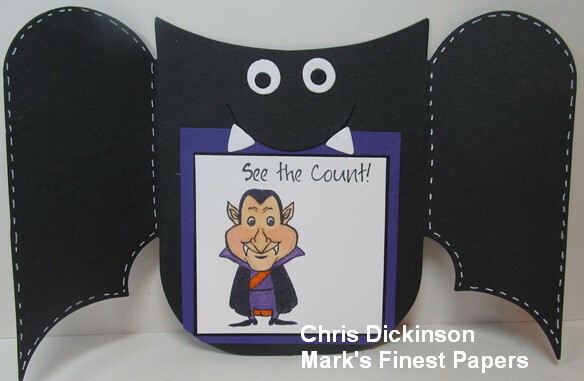 This card is actually a fabulous die cut from Creative Cuts and More called the Bat Card with Fangs and Eyes. Isn't it SO cute? Be sure to HOP through to see the very talented Mark's Finest Papers Design Teams work! They are sure to WOW you!!! Thank you for stopping by! Hope you have a fabulous day! If you are here for the Mark's Finest Papers, please scroll down one post after you look here. Hello Everyone!!! Welcome to my little corner of the world today!!! IN Wisconsin, did you hear? We are getting smoke all the way from Minnesota which is a couple hundred miles away! So that has totally changed my plans for the day. I am going with it though and planning to STAMP!!! Anyways, today is Belli Challenge and DRS DESIGNS day!!! This week's Belli Challenge is to create a card using Challenge #126 (STRING)! The spirit of the Belli challenges is to encourage you to use your OLD and FORGOTTEN embellishments! Aren't these images so FUN!?! This is the brand new release from DRS Designs! You can see the entire release HERE. You will enjoy perusing the website for the new fun, fall images! I used the Technique Junkie Newsletter and the technique called Marbled Smooch from the October/ November 2010 Issue. After I dried the background using that technique, I spritzed it again with Smooch Spritz in the Splash Color. Once I finished that, I embossed with Gold Embossing powder the INTERLOCKING STAR BACKGROUND - SKU819H in a diagonal across the cardstock. Believe it or not - this background piece started out as a white sheet of cardstock! Once that was heated through, I watercolored the Stars with a Mustard Watercolor. Once that portion was done, I stamped the Silhouette Cat and Moon SKU 895F with Memento Black Ink and colored it with Copic Markers YR24 and YR20. I used my handy dandy scissors and cut the image out. Once that was done, I masked the moon and spritzed with Smooch Spritz in Black Velvet. 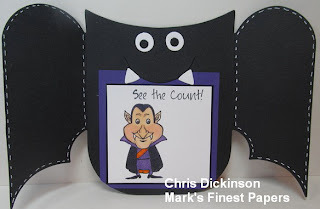 I stamped the Spooktacular Halloween Greeting SKU933F on the Elegant Ovals Spellbinders dies. and sponged the layer with navy and mustard ink. 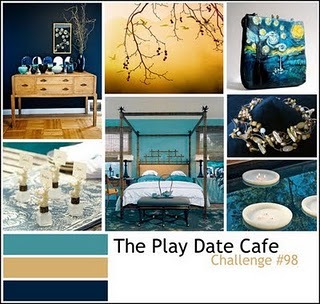 When you are done looking here be sure to check out the DRS Designs Blog, play along in both challenges, and check out my fellow Design team Belli challenge blogs listed below.